Supreme God KuroPanda aka Kuroda Reaper is a 30 year old (DOB: September 2, 1988) pure-blood wizard living in Hogsmeade. He wields a 14¾" Ash, Phoenix Feather wand, and is a member of Slytherin. His favorite Harry Potter book is Harry Potter and the Goblet of Fire and his favorite Harry Potter character is Ginny Weasley. Kuroda received his Hogwarts letter, attended school and graduated normally like every other student his age. He never had many friends in school, being a very quiet person who kept to himself a lot, but went on to meet an amazing woman who he married shortly after graduating, SeraphiaWhiste. After being happily married for several years, and having 2 children together, WindLeaf, and Stardazzle, his wife and one daughter were killed in a horrible accident. Devastated, Kuroda left the wizarding world, and no one heard from him for a few more years. Finally, he decided that he needed to move on, and in February 2018, he was back. Kuro has what many would describe as a dark aura, he keeps in the shadows and doesn't step out in public often. If he does, it is because someone or something has piqued his interest, and it is rare that that happens. But for the few friends he does have, he will go to the ends of the earth for them, and is fiercely loyal. He works in the department of mysteries, and spends almost all of his free time down there. He loves his work. 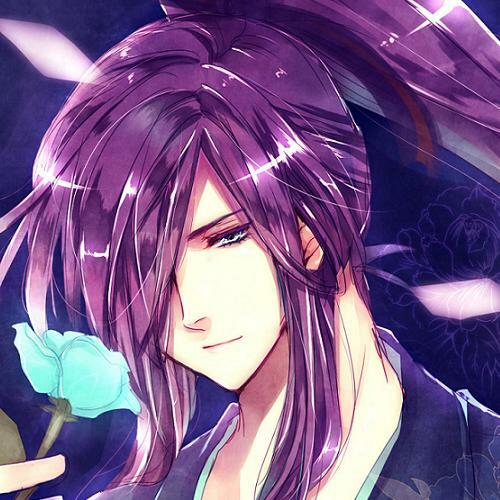 Physically, Kuro is tall, with pale white skin, and long purple hair that he wears in a ponytail. He has bright, pale blue eyes, and even though he seems unapproachable at first glance, he actually has a warm smile for those who try. Not long after returning to the wizarding world, Kuro was wandering through the forest when he wandered upon a clearing. There, he met the most incredible witch named Diaphonie, where the two spent the night camping under the stars, talking until the early morning. She was special, and he quickly learned to open his heart to her after vowing to never love again. On March 1st, 2018, the two were married.